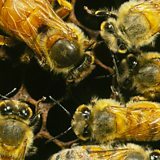 BBC iWonder - How does art help us remember World War One? 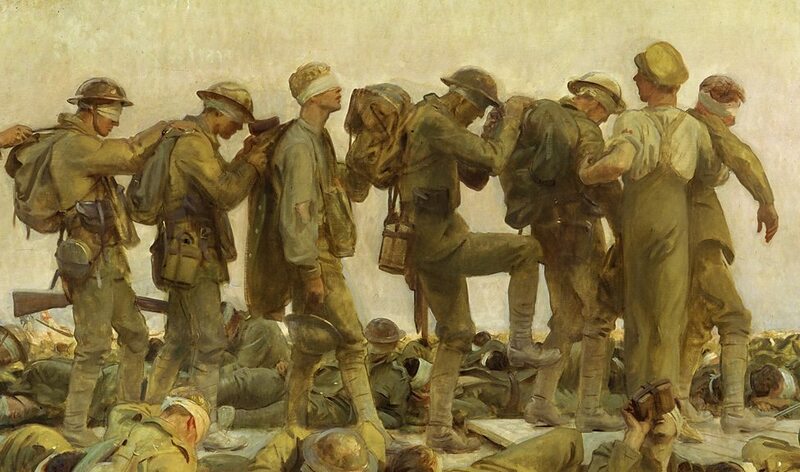 How does art help us remember World War One? World War One’s completely new kind of mechanised warfare came as a huge shock to the British public. At the start of the conflict, the accepted style of war painting was a legacy from Victorian times. Its heroic battle scenes and reassuring patriotic messages could no longer be believed by a population exposed to total war. What followed was a revolution in art, as artists struggled to depict the reality of life at the front. And whether revered or ridiculed at the time, all of these paintings can help us remember World War One today. The Kensingtons at Laventie (1915) by Eric Kennington. Exhibited in 1916, The Kensingtons at Laventie was painted by an artist who had experienced the war first hand. Eric Kennington was a young soldier who had fought in France, been wounded and sent home to recover. 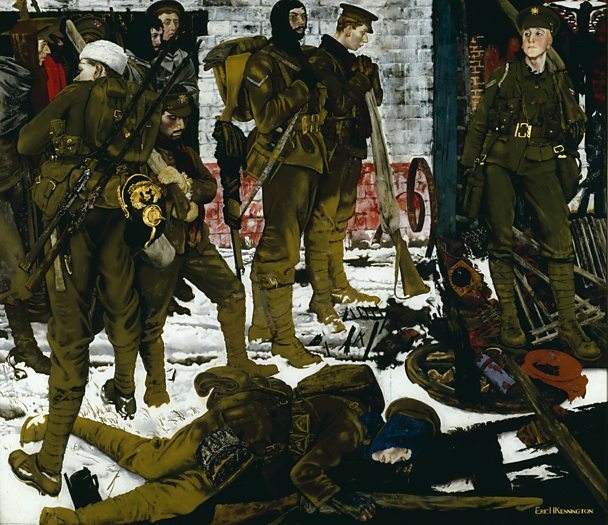 This work shows him – in the black balaclava to the left – and his company arriving exhausted at their billets, straight from the front line. He has made a mundane incident from the daily grind of trench warfare hugely telling. His choice to paint ordinary soldiers, resting rather than in combat, was a completely new and revolutionary approach to depicting war. The Kensingtons at Laventie was ground-breaking in another way – it galvanised the upper classes into petitioning the government to commission art as a memorial to those who fought in the war. Here is an entirely new form of war art: Futurism. This bold, new, modern style with continental origins had just begun to take root in Britain at the start of the conflict. Christopher Nevinson was a 27-year-old artist invalided out of the Royal Army Medical Corps. This is his interpretation of the war: overwhelming, completely alien, and utterly un-heroic. 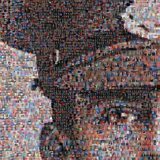 Despite their all too human exhaustion the men in the painting, through their uniforms and geometric simplification, form a single mass bound into a war machine. Together with the sharp diagonal of the cobbled highway – up which a soldier glances, legs outstretched and hands pocketed – it serves as a pitiless reminder of the compelling force of war. This more experimental style became thought of as very effective in rendering the unprecedented experiences of the conflict. According to the contemporary art critic Charles Marriott, it provided a more intense reality than ‘realism’. 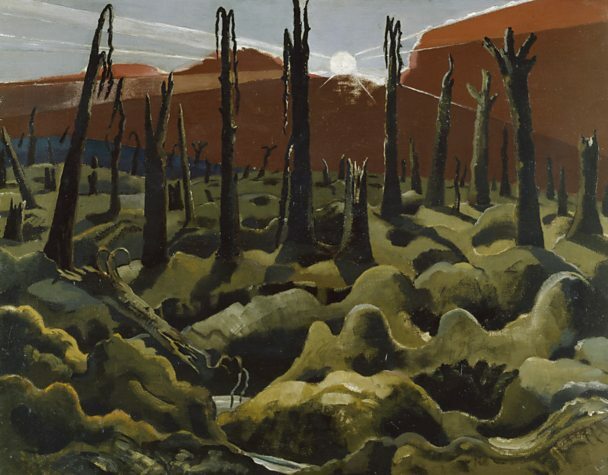 Paul Nash's paintings have become an important visual reference for us when thinking about the conflict, including this powerful, apocalyptic vision of nature violated by war. He was commissioned by a government scheme, started in 1916, which initially aimed to illustrate publications with drawings to supplement the limited photographs available. Nash had served briefly in the Ypres Salient in 1917 before being invalided out. When he returned to Belgium as an artist, he was shocked by the devastation wrought by the battle of Passchendaele. All of the commissioned artists’ work had to be passed by the official censor. While depictions of dead British soldiers were unacceptable, this devastated landscape managed to pass unchallenged due to its symbolic, rather than literal, content. Nash’s startling, new, modernist vision would bring him huge acclaim in the art world. 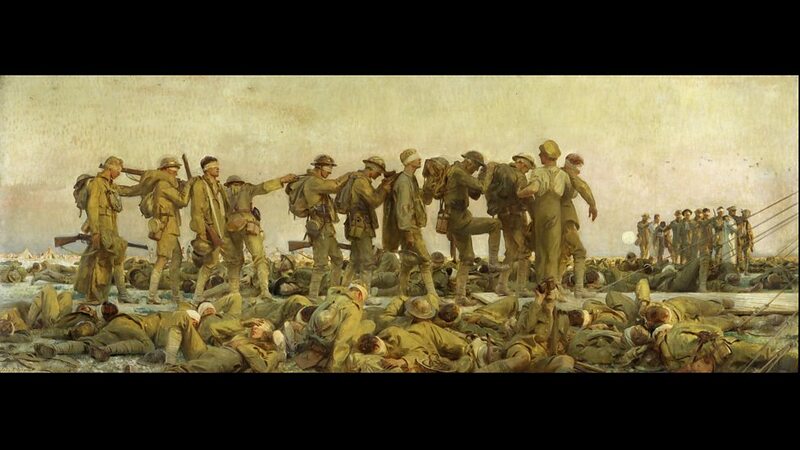 John Singer Sargent's Gassed is probably the most popular painting in the IWM’s art collection, and, for many, is the image which sums up the war. As people struggled to come to terms with the conflict in its immediate aftermath, they sought out images with a story giving hope, a wider meaning, or purpose. Commissioned by the British War Memorials Committee, it was intended as a centrepiece for a new hall of remembrance at Richmond Hill, London. Sargent, an established portrait painter, was required by the Committee to see his subject at first-hand. It was inspired by an encounter with the grim aftermath of a mustard-gas attack on the Arras-Doullens Road, in France, July 1918. Although based on real events, the picture is infused with symbolism, drawing on the traditions of history painting. 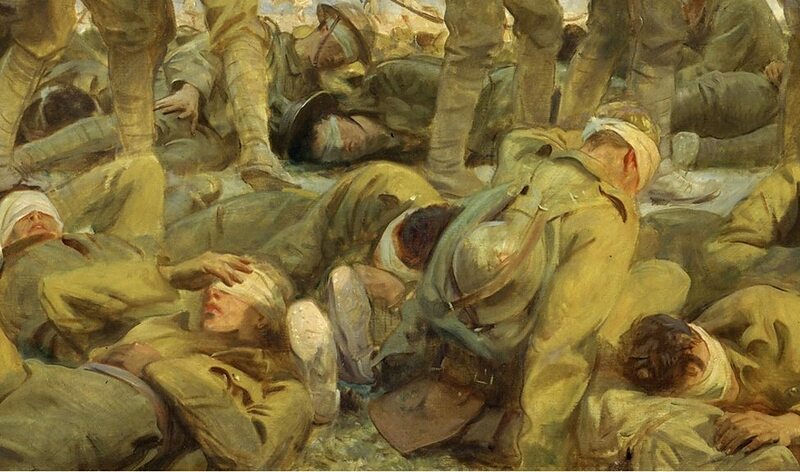 The soldiers lying at the foot of the canvas await ‘resurrection’. And redemption is at the field hospital just beyond the picture’s edge. William Orpen, a well-connected society portrait painter, abandoned his safe administrative Army job to become an official war artist. He spent time in France between 1917 and 1919, and developed a passionate admiration for British soldiers. The government chose him, under the supervision of the Imperial War Museum, to create a "memento" of the Versailles Peace Conference enshrining the Allied victory. However, whilst at Versailles, Orpen was appalled by what he considered to be political scheming. So he replaced an initial group portrait of the Allied generals with a coffin flanked by two emaciated soldiers. 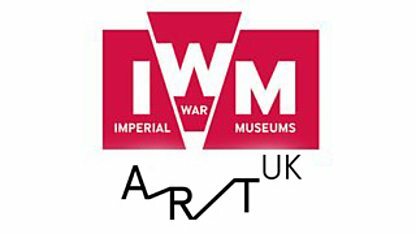 The Imperial War Museum, greatly embarrassed, declined it. 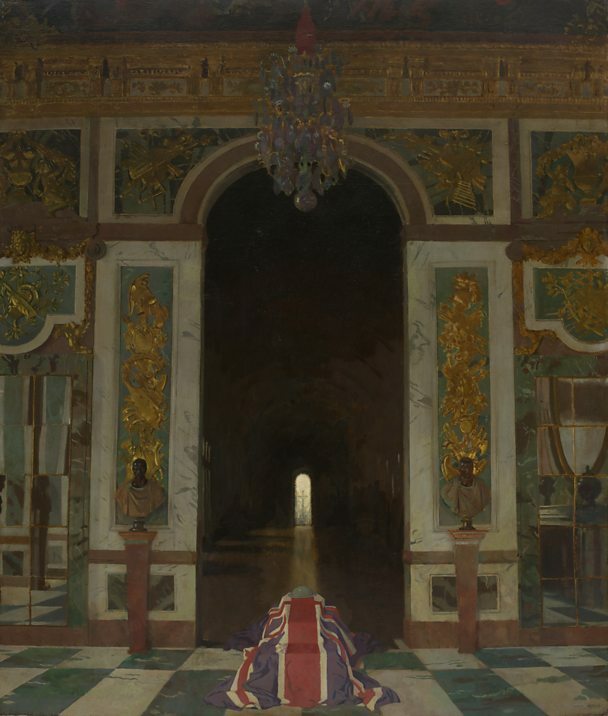 In 1928, Orpen re-offered it to the museum. The decision to take it this time was a compromise. He painted over the emaciated servicemen and the museum accepted it as a fitting tribute to the Unknown Soldier. And, as time had passed, the picture had duly become representative of a new public mood. People now regarded the war as a common effort and a great sacrifice, but something to be prevented in future at all costs. 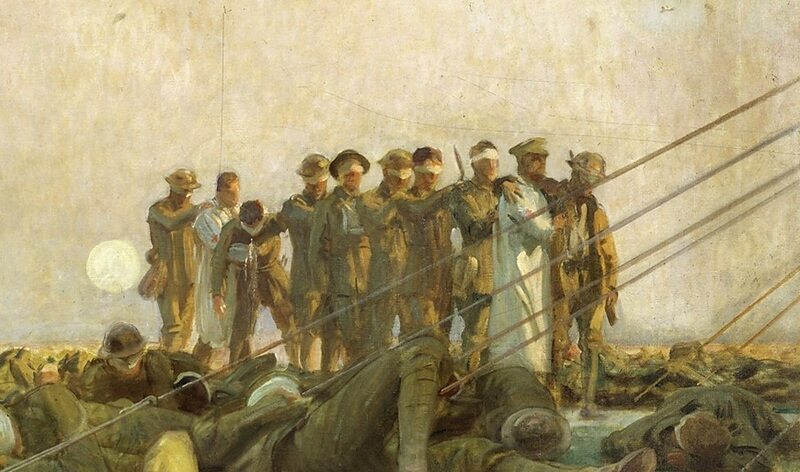 How can art help us remember the war away from the front line? Britain endured its first civilian air-raids during World War One. Around 1,400 people were killed and more than 3,400 wounded by German bombs. For the first time civilians were mobilised to help fight the war from home soil. 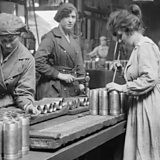 Over one million women took on roles from driving trams to making TNT. 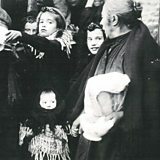 The war displaced hundreds of thousands of people. Around 250,000 Belgians alone headed for Britain after their country had been invaded by German forces. Remembrance Day 2014: How will we remember them?